A team of Indian astronomers has discovered an extremely large supercluster of galaxies -- as big as 20 million billion suns -- which they have named Saraswati, Pune-based Inter University Centre for Astronomy and Astrophysics said. The supercluster was discovered by Shishir Sankhyayan, a PhD student at the Indian Institute of Science Education and Research, Pune, Pratik Dabhade, IUCAA research fellow, Joe Jacob of the Newman College, Kerala, and Prakash Sarkar of the National Institute of Technology, Jamshedpur. 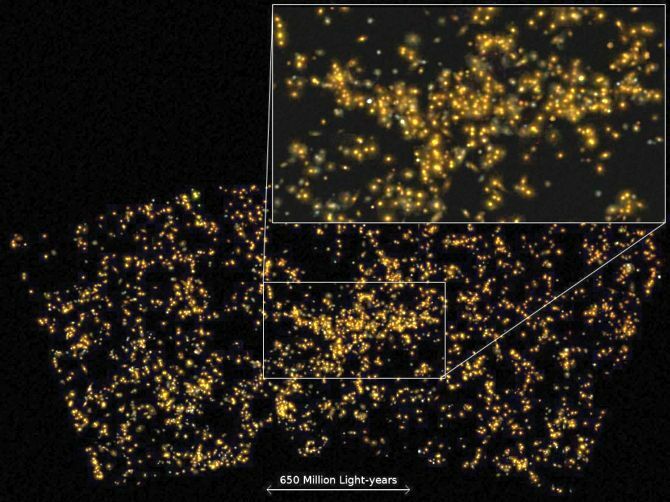 Sankhyayan said this “newly-discovered Saraswati supercluster” extends over a scale of 600 million light-years and may contain the mass equivalent of over 20 million billion suns. Joydeep Bagchi from IUCAA, the lead author of the paper in the journal, and co-author Sankhyayan said they were “astonished to spot this giant wall-like supercluster of galaxies”, visible in a large spectroscopic survey of distant galaxies, known as the Sloan Digital Sky Survey. “This supercluster is clearly embedded in a large network of cosmic filaments traced by clusters and large voids,” Bagchi said. He said previously “only a few comparatively large superclusters” had been reported, such as the Shapley Concentration or the Sloan Great Wall in the nearby universe. “The Saraswati supercluster is far more distant,” Bagchi said.